Perhaps our most durable 72? 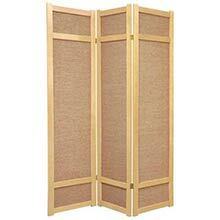 screen, this unique-looking Japanese room divider is made with woven jute panels in place of the traditional white rice paper. Offering complete privacy, this screen will block out all light and is completely opaque. 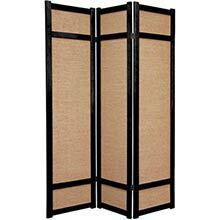 Perhaps our most durable 72" screen, this unique-looking Japanese room divider is made with woven jute panels in place of the traditional white rice paper. Offering complete privacy, this screen will block out all light and is completely opaque. The frame of the screen is made from beautifully finished spruce wood stained a gorgeous rosewood color. Lacquered brass two-way hinges allow the panels to bend in either direction. This screen will compliment your home or business while providing a private space.